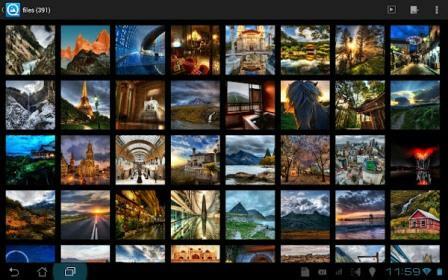 QuickPic: The Best Photo Gallery for Android! The diversity of applications for Android is immense. Incidentally through a little research on Play Store easily find applications that are optimal substitute for applications that come factory installed. Ever had the feeling that the gallery that came with Android Gingerbread left much to be desired ? In fact that 3D effect introduced by Cooliris navigating this application distracting the user to make a practice of managing your images . Fortunately from version 4.0 Google realized the limitations of this application and evolves it to be less exuberant and more practice. Add to that the habit that OEMs have to change the look and extensively customize many native Android applications , and the application of one gallery , there are some reasons to start looking for an alternative application. The QuickPic emerges as probably the best application of this gallery at Play Store. This application is able to combine , while simplicity, speed and customization . It is customizable logo to match, because it allows you to set the display mode of your albums. You can choose from the gallery mode , gallery ( grid ) , Gallery ( List ) and Explore mode. The loading of images and scroll through the images is fast ultra lightweight derivative features that this application requires. And speaking of scroll , the user has the flexibility to choose how to navigate through your images. It has two modes , the vertical scroll where the user takes the scroll from top to bottom or vice versa as was to view content on Gingerbread or earlier version of Android . In Scroll mode the horizontal QuickPic replicates the behavior of Android 4.0 or higher , in which to view the images have to scroll from right to left (or in reverse ). In addition to browsing / viewing their photographs explicitly ( one by one ) , you can choose the display mode on the slide, allowing the pass QuickPic your photos automatically using a soft transition ( as you were viewing a digital photo frame ) . This application also allows you some more advanced features , such as the option to hide one or more picture albums . The QuickPic still allows easily rotate images , or apply over the images of handling basic block selecting images , copy and / or delete. You get the sharing options that has become accustomed to having the normal gallery application , you can share images with gmail , blueetooth or facebook ( if you have installed the application from Android ). We give special emphasis to three details that we liked a particular way in QuickPic . The first is the very neat interface and in accordance with the guidelines of the Holo UI ( user interface elements with blue and black ) , which was introduced in version 4.0 of Android . Another detail is that this tool is part of a range of applications in the Play Store , which fit properly to your screen. This means that if you have a smartphone and always depending on the size of the screen you will see a limited number of previews of images at a time . If however you have a tablet application adjusts to show you a greater number of previews. Finally the third trump quickpic concerns the low level resource requirements . This means that more than being a small application based on testing we have done the QuickPic is achieved by taking as an application gallery even faster than the native Android Gallery. 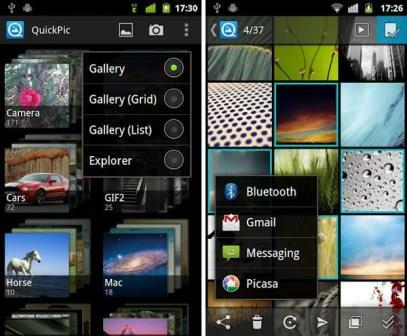 Installing QuickPic will not substitute its application gallery that is included on your Android, for this reason we advise you to try. Next articleWant Some HTC Sense 6 Apps on Your Android?